Flash, nylon case, white bounce card, wide angle diffuser and instruction manual. Nice picture on box, but it's not being enhanced by using a flash. All plastic, cheap switches and buttons, but it has a decent fit and finish. Maximum output seems less, maybe 1/3 stop than other models with same rating. 1.7" X .55" (42mm X 14mm). No color. Pushing the "light" button illuminates the screen in green for about 5 seconds. Displayed items include; flash range indicator, zoom position, TTL/Manual , Power ratio setting, ISO (25, 50, 100, 200, 400, 800), and F/stop (1.4, 2.0, 2.8, 4.0, 5.6, 8.0, 11) info. On-off slider, test button, red "Ready" button, and green "OK" light that comes on for a second after the flash fires with the proper exposure, but comes on with almost all exposures. About 6-7 sec at 1/1, and almost instantaneous at lower levels in actual use. Recycle times are longer when pushing the test button at all except 1/1. Yes, after three minutes it goes into sleep mode, but will never turn off completely; wakes up after pressing any button on flash, or the camera's shutter button, but wait for red charge light before using. Five full levels only; 1/1, 1/2, 1/4, 1/8, and 1/16. Plastic clip on, covers down to 20mm, (14mm APS-C) and shows on LCD when attached. Yes, white thin plastic card, 82mm x 61mm (3.3" x 2.4") inserts in slot at flash top, but doesn't lock. 28mm, 35mm, 50mm, and 85mm. The light pattern between 35-85mm is somewhat square. External, manual "push-pull" operated. You must remember to set this to the focal length in use, otherwise the flash may not cover the entire frame, or the middle will be overexposed etc. 3.1"W x 7.0H x 2.4D 79mm x 178mm x 62mm Maximum length 8.0" (203mm) including shoe mount. Depth measured with flash flat. 10.4oz (295g) without batteries, 14.3oz (406g) with batteries. 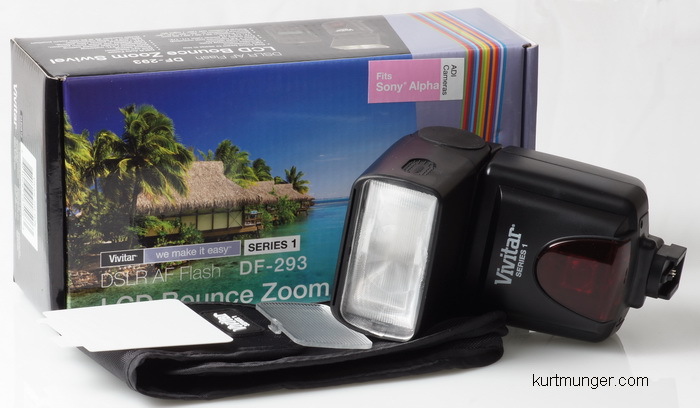 LCD review and menu functions are sometimes cut short or cancelled when flash is mounted and turned on, must be the flash is powering discreet actions, similar to half pressing the shutter button and returning to the default screen. Has adjustable power levels and zoom features which are rarely seen in this price range. Great for off-camera radio controlled flash use in manual mode (Radiopoppers tested), plus it won't shut off in the middle of a photo shoot after a short period of inactivity. 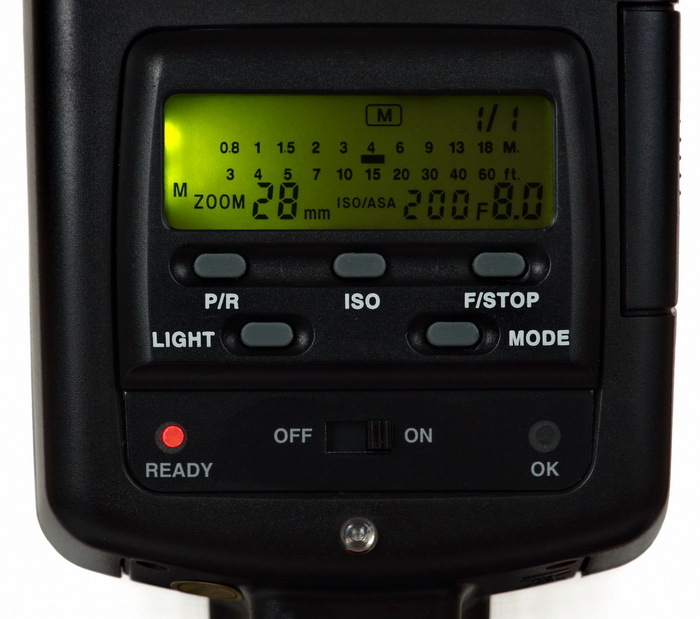 Could be a very economical choice for on-camera occasional flash use, just remember to adjust the zoom position. Fully automated operation, wireless optical use, or people wanting HSS. No, quality control is awful, do not buy!